Hello, my name is Hina, I am a student at Joseph Swan Academy. In July 2015 I completed a 1 week placement with GemArts as part of my work experience. While working with GemArts Director, Vikas, and the team, I got to see what goes on behind the scenes at their events and during their other project work. During my week with GemArts they had an event at the Newcastle Beacon, to celebrate the East by North East project GemArts led which helped young people from Newcastle learn about and create their own music. I helped GemArts Administrator, Jade, make sure there was enough CD/DVDs for the guests, and prepared the room before everyone arrived, making sure that the venue had enough space for the speeches and performances to take place, as well as helping set up the catering and check the sound. We handed out leaflets which included a running order of what would happen during the event. During the event there was a video about the progress young people have made producing their own new music. GemArts also presented some young people with Arts Award certificates which show how much commitment and hard work they had put into the project. Some of the groups also performed their music, which all the guests thoroughly enjoyed. At the end we helped tidy up the venue and had a chat with artists and guests that had attended to say thank you for coming and supporting the event. This opportunity was really interesting because I got to see what goes on behind the scenes of planning events and seeing the types of projects GemArts deliver. Another interesting part of my work experience week was when I visited GemArts visual arts projects. My first visit was to the project working with a group of young mothers from different backgrounds living in Byker. I went to see this group, who meet up weekly in the Newcastle Byker centre with GemArts’ Project Manager, Alex. The women meet weekly, and work with GemArts artist Emma, learning how to make beautiful artworks using different materials. After seeing this group of women work together it made me think about how art can bring people from different backgrounds and cultures together, where strangers can start to get along like they are old friends. To me it shows how powerful and universal art is, something which I hadn’t previously thought about. During the rest of my time working for GemArts I learnt how different people had different roles to help maintain the work of the organisation, and how the office runs. GemArts Communications and Development Officer, Sinead, explained how the organisation looks for opportunities and works to increase their audiences and the coverage of their events and projects. Part of this work included updating the school and organisation contacts lists on a database so the team will be able to contact these people about future projects and events. Overall I really enjoyed my time working for GemArts for my work experience, and I learnt a lot about how they and other groups operate. 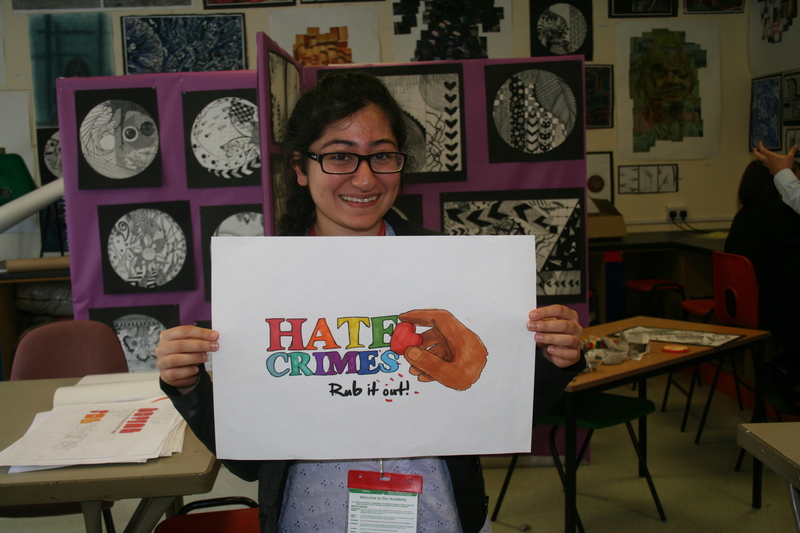 Here is a photo of me on a visit to one of GemArts’ secondary school projects holding an Anti Hate Crime posters design created by year 8 pupils.